As everyone knows, I love to cook so when it came time to preparing food for my baby, I knew I wanted to make it myself. This way, I could control what sugars and preservatives my daughter was getting in her main meals. Truth be told, sometimes it's a pain in the rear. Sure, steaming food is easy, but the clean-up is what gets me. So many dirty pots and utensils. 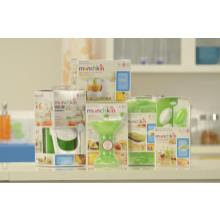 When I was given the chance to review Munchkin's Fresh Baby Food System, I jumped at the opportunity. This is a 3-stage system that chops & steams, blends and mashes and stores. Each item is purchased individually, but can also be used separately or together as a system. I am in love with this product. You can take raw vegetables (I used carrots and celery), place them on the chopping grid, push the handle down and voila! Perfectly cut cubes of veggies. Best part: they fall directly into the steamer basket. No more chopping on the cutting board and making a mess everywhere. I can't believe how easy this was and may actually use it for our adult food, in addition to baby food. THEN, you add a very little bit of water to the steamer basket, remove the blade and handle and voila again! You have a steamer basket that can be popped into the microwave and veggies steamed in a couple minutes flat. I steamed a bunch of veggies, turned some into a puree and saved the others in a small container in the fridge for snacks. So easy, so fast. There are 2 products in this line - the Fresh Food Grinder and the Fresh Food Maker. Simply put, the grinder is a food mill and the maker is a food processor but they are more than that. They are easy to use and easy to clean up. You can take your freshly steamed veggies and drop them in either machine and within seconds, you will have blended chunks, or blended puree. The Fresh Food Maker is a nice size, it doesn't take up a lot of room in the cupboard and features Munchkin's exclusive Click Lock technology - no flying food! I'm a fan of making a lot of food and storing it. It definitely makes the best use of your time. Pour some of your freshly pureed foods into the Click Lock Fresh Food Freezer Trays for easy storage, or - this is really cool - turn them into popsicles!! With the warm weather coming ANY SECOND, I will definitely be making use of the Click Lock Fresh Food Freezer Pops. Strawberry Banana pops perhaps? What about Blueberry yogurt? Yum! The pops come with easy-to-grip handles and a built-ion drip catcher to help prevent messes. And speaking of preventing messes, all of these products (with the exception of the electronic components) are dishwasher safe! Woo hoo and three cheers for Munchkin! The retail price of this system is $64, which, I think is Simply Suppa! Disclaimer: I am a PTPA Blogaholic and occasionally receive items for review. The opinions expressed on my blog remain my own.